Wallpapering Fog: No Mr. Bond, I expect you to buy. No Mr. Bond, I expect you to buy. I was reading Risk on the plane to Slovenia. It's good. There's a section on how Advertising influences people and - as so often - the outsider's view of our industry is one of machiavellian psychological techniques influencing an unsuspecting population. Anyone who's worked in an agency for a month knows it's not like that. We're not that clever and we haven't got the time to be machiavellian. 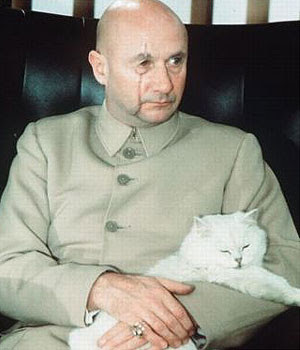 You need serious thinking time to become an effective Bond villain (bet they have really long holidays.) Most of the time, we're just happy to hit deadlines. And so to the thinking. Why aren't we using the latest sophisticated psychological techniques in our efforts to sell ever more things? Marketing postgrads learn about them and then leave them at the door when they start work in an agency (there are two sat next to me right now testifying that this is true.) Psychological manipulation works when it's used, so why isn't marketing the domain of the psychologist? With those who don't understand and apply the lastest research left by the wayside? To understand, we can go back to basic economics. Not supply and demand, or price - more basic than that. What are peoples' incentives? This is what Freakonomics does (repeatedly) to solve what look like complex problems. Why would schoolteachers cheat? How come most drug dealers are poor? Why aren't most marketing campaigns cleverer? It's because we don't really know how effective they are. Not often anyway. There's no objective measure of whether your most recent campaign was any good at selling product. Research can tell you if people liked it and econometrics can average the effectiveness of lots of campaigns. Nobody can tell you definitively whether this latest campaign is more effective than the last one unless it's absolutely brilliant. So for marketing agencies, what's the incentive? The goal is to win business and they can't do it by proving they've made an effective ad. They win pitches by making ads that marketing directors like. And by convincing marketing directors that they've made an ad that will work. Marketing directors aren't psychologists either, usually, and the ads they like may or may not be effective. So we end up with agencies full of salesmen, trying to persuade marketing directors that the ads they've made will work. And these select few marketing directors aren't incentivised to buy an ad that will actually be effective either - because it can't be measured. They need an ad that will impress the CEO and he's definitely not up to the minute on the latest psychological research. Could it be? Is it? Finally?